St. Ann & the Holy Trinity Church hosts art historian Harriet F. Senie who will give a lecture on her new book, Memorials to Shattered Myths: Vietnam to 9/11, on Tuesday, January 26, 7:00 pm. The event is a presentation of The Forum @ St. Ann’s, which seeks to engage the community in conversation about the arts, ideas and civic life, and is free and open to the public. The Vietnam War, Oklahoma City bombing, Columbine High School shooting and attacks of 9/11 all shattered myths of national identity. Memorials to Shattered Myths traces the evolution and consequences of a new memorial paradigm, which grants a heroic status to victims and by extension to their families, thereby creating a class of privileged participants in the permanent memorial process. Senie argues against this practice, suggesting instead that victims’ families be charged with determining the nature of an interim memorial, one that addresses their needs in the critical time between the death of their loved ones and the completion of the permanent memorial. Senie also observes that these memorials are inadvertently based on strategies of diversion and denial that direct our attention away from actual events and reframe tragedy as secular or religious triumph. In doing so, they camouflage history, and seen as an aggregate, they define a nation of victims, exactly the concept they and their accompanying celebratory narratives were apparently created to obscure. 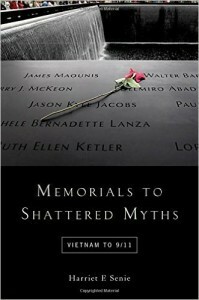 Memorials to Shattered Myths was published by Oxford University Press. The book will be available for purchase at the special price of $20 at the reception after the lecture. Senie is a Professor of Art History at City College, CUNY, where she directs the M.A. program in Art History and Art Museum Studies, and she also teaches at the CUNY Graduate Center. She is the author of several books and numerous articles on public art, as well as co-founder of the international organization, Public Art Dialogue, and co-editor of its journal, Public Art Dialogue, the only peer review journal devoted to public art. The anthology, Companion to Public Art, that she co-edited with Cher Knight will be published by Wiley-Blackwell later this year.